The collection of historic posters at the Royal Opera House contains more than 3,000 items and continues to grow as copies of current posters are deposited on a regular basis. Posters have been a lively part of theatre life since the 18th century, and evolved out of the nightly playbills distributed by theatre companies to advertise their performances. The earliest poster in the Royal Opera House Collections dates from 9 December 1809, two months after the opening of the second Theatre Royal, Covent Garden. The banner headline announces ‘New Theatre Opens’ and the poster advertises a performance of ‘A Grand Melo-dramatick Opera … The Exile’ followed by the farce of The Portrait of Cervantes; or, The Plotting Lovers. The cast of both pieces is given in full, and at the bottom of the poster are details of times, prices of admission, and a list of performances for the forthcoming week – no two nights the same. The second Theatre Royal, Covent Garden became the Royal Italian Opera in 1847, and the collection houses a few posters from the 1840s and 1850s for performances in the newly converted theatre. The majority of the collection dates from the early 1900s onwards. The early posters are almost always printed with text only, very occasionally with an illustration. The visual interest in the 19th century comes from the variety of typefaces used throughout the text, with coloured inks for the title of works. 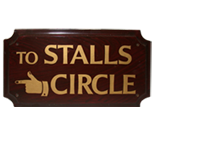 As successive Covent Garden theatres have operated under the Letters Patent granted by Charles II, they have always been allowed to include the royal coat of arms on the posters, which adds to the decoration. Towards the end of the 19th century, poster design underwent a major development as changes in print technology allowed for easier reproduction of graphic design, and visitors to London would see images on billboards all over town. 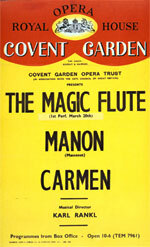 The Royal Opera House, however, continued to produce posters that were text only. The posters were instantly recognisable as advertising performances at the Royal Opera House and it was felt that the information would be sufficient to catch the eye of the public. The design underwent changes in 1946 and 1965, but remained text only. Images were introduced in 1975, and now individual posters are designed to reflect the nature and style of the production that they are advertising. The 19th century posters are stored in chronological sequence, while those from the 20th century onwards are arranged as follows. Posters advertising individual productions currently number more than 1,600 and come in a variety of sizes. Between 1905 and 1939 individual posters were produced for single performances, and listed the entire cast and conductor. They were printed in a uniform style with a banner headline in green and the main text in black on a white background. Occasionally red ink would replace the green. In 1946 the design changed: the theatre’s name was printed on a red curtain-like swag at the top with the production details in black text on a yellow background underneath. In 1965, this style was replaced with three horizontal bands of red, pink and orange. Photographs and decorative graphic design were introduced in 1975 to create a unique poster for each production. Typically, the post-World War II production posters advertise a series of performances and do not list the cast. They include those for significant twentieth-century world premieres, including Benjamin Britten’s Billy Budd in 1951 and Kenneth MacMillan’s Mayerling in 1979. Season posters date from 1902 to the present, and list forthcoming performances at the Royal Opera House for each booking period. They follow the same changes in colour and design as the production posters. Posters advertising the UK and overseas tours undertaken by The Royal Ballet and The Royal Opera are usually created by the host venues. The earliest ballet tour poster is for the visit of the company to the Florence Maggio Musicale in 1949. This collection of posters includes production and season posters for The Birmingham Royal Ballet under its previous names, from 1958 to 1997. The posters for visiting companies giving seasons at the Royal Opera House follow the style of production and season posters from the early years of the 1900s through to the 1970s. Since then, posters in different styles are created for each season and celebrate the work of companies as diverse as the Bolshoi Ballet, the Kirov Opera and the Kirov Ballet, the Azuma Kabuki Dancers, and Welsh National Opera. Two albums contain examples of all the printed materials for the social dances held at the Royal Opera House between the seasons of ballet and opera. These date from 1929/30 and 1930/31 and include posters for events such as ‘The Joy of Life’ Ball in 1929.